We would love to find out what we can do to make your special day just perfect. Please complete our enquiry section to receive a quote, call (02) 9887 4422 or email functions@northrydegolfclub.com.au to arrange a meeting with our Wedding Coordinator and inspect our Wedding facilities. The Auditorium accommodates 50 – 130 seated guests and offers a private balcony overlooking the golf course with water vistas, private bar, tiered ceilings, staging and a large parquetry dance floor. The Clubhouse incorporates the Auditorium & Members’ Lounge areas of the Club, which can accommodate 131 to 240 seated guests. This function facility offers a large private balcony overlooking the golf course and water feature, two bars, staging and a large parquetry dance floor. Level One incorporates the Auditorium, Members’ Lounge & Restaurant areas of the Club, accommodating groups of 241 to 300 seated guests. Enjoy the exclusive use of the Club’s facilities and services for your Wedding Ceremony. Searching for your wedding ceremony or photographic location? When you book your reception at the Club, we are happy to provide our beautiful First Tee area to you for your ceremony. This area is a gorgeous outdoor facility which is able to accommodate 200 guests. The immaculate lawns are bordered by gardens offering year round beauty, water views and serenity to match. Head off onto the course in your Bridal Golf Carts to take wedding day photographs to treasure. The Auditorium, with its glass outlook and adjoining balcony offering stunning panoramic views across the golf course, is the perfect setting for a wedding reception or to celebrate your special occasion. This room contains its own service bar. Centred by a parquetry floor large enough in size for all your guests to enjoy a dance, this is the perfect venue for your larger function. The Auditorium is able to comfortably accommodate 120 seated guests with the dance floor, 150 seated guests with no dance floor or 230 guests in a cocktail style setting. This room has the staging facility for a show or dance band. 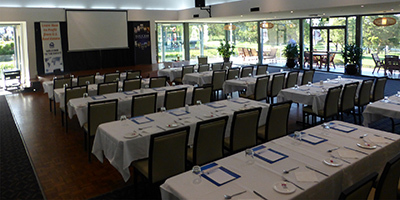 The Auditorium is also available for larger corporate events. The Azalea Room and adjoining courtyard is ideal for barbecues and more informal parties. This room is able to hold up to 90 guests seated and 150 guests cocktail style. The facility is also available for medium sized corporate events and is able to be set up in a number of setting styles. Guests are welcome to utilise the open courtyard to mingle. Overlooking the 18th Green through an expanse of glass windows, the Gardenia Room is perfect for intimate celebrations or corporate meetings, training sessions and seminars. 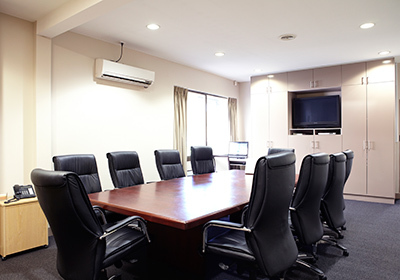 Depending on the type of event and setting style required, the Gardenia room is able to accommodate up to 40 people. On Friday or Saturday evenings from 6.00 pm a minimum of 30 guests is required. The Club offers the 1st and 10th Tee areas as outdoor function spaces. Each area can accommodate 130 seated guests or up to 250 guests in cocktail style and are both set in the gardens by the clubhouse. Nomadic Tents is a national company providing outdoor cover solutions for weddings and events. Our stretch or freeform marquees are stunning and provide an all-weather solution for outdoor events as well as being a stunning feature for any event. We can cater for almost any number of guests with our different sizes and because our tents are freeform we can create a variety of shapes and side heights to suit individual requirements. We have been providing wedding and event cover solutions since 2008 so we have plenty of experience and always get fantastic feedback from our clients. Check out www.nomadictents.com.au for images and examples. The Clubhouse is a combination of both the Auditorium and Member’s Lounge areas. This facility is available for bookings which exceed the maximum numbers able to be accommodated in the Auditorium. This area, under special conditions only, may be extended into the Restaurant area when numbers are in excess of 220 people. Members and guests are able to relax and enjoy a drink after their game of golf or before dinner in the casual yet comfortable Members’ Lounge which boasts magnificent views of the golf course. Members have the use of their appropriate locker rooms. Lockers are able to be hired through the Club office. Locker rooms are also available for use on corporate golf days. Relax and enjoy a casual dining experience or quiet drink on warm summer evenings under the sails on the balcony. The balcony, running the length of the Club and overlooking the golf course, is able to be accessed from the Members Lounge, Auditorium and Restaurant. North Ryde Golf Club boasts an 18 hole golf course covering 75 sprawling acres. Many years’ labours of love have helped establish a wonderful golfing playground with rich traditions. The therapeutic benefits provided by the tranquillity of the environment and the warm welcome offered to all by its Club members represents “golf’s breath of fresh air”. Room Hire Rates are based upon functions spanning a maximum of five hours. Extensions to Room Hire approved given notice. © 2017 North Ryde Golf Club. All rights reserved.